We combined organic matcha green tea with bio cane sugar and natural spring water. This is not another lemonade. It is the elixir of life which contains natural caffeine and lots of antioxidants. Sometimes you have to go a long way to find simplicity. 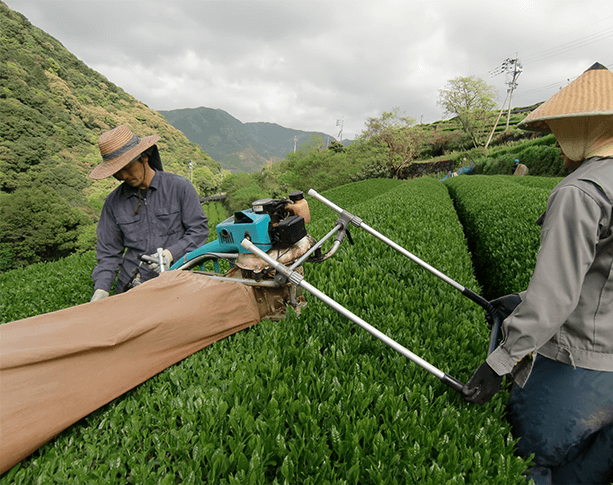 The ceremony of brewing matcha – a powdered green tea – which we discovered during our trip to Japan, has taught us that. Through nearly three thousand years of practice, the Japanese have learned about the beneficial effects of matcha, which strengthens and cleanses the body, supports concentration, improves mood and sharpens the mind. The Japanese tea ceremony is not just chemistry at work, but also spirituality: an atmosphere of peace, concentration, concern and an exercise in seeing the beauty in ordinary things and daily activities. We wanted to find a way to share with you both the health benefits of this plant as well as the essence of the experience of this centuries-old tradition. Using the highest quality products and following the principles of the ancient cha-no-you ceremony, we decided to create a modern natural drink, a body and soul elixir, which will be available on a daily basis. We drove hundreds of miles visiting plantations and talking to people for whom tea is a life passion. Traditional farmers who have used natural methods for generations helped us understand how to preserve the essence of traditional harvesting and brewing using modern production process methods. It was worth it. Noble composition and carefully selected ingredients have proved to be the key to health. Now we want to share with you the fruits of our work. That's how we created YOKO. An elixir of life that lets you stay in the moment and then continue with fresh new energy. YOKO. HEALTH IS IN THE SIMPLE THINGS. Striving to keep up with what is going on around us and our current pace of life, we are looking for regenerating and stimulant agents that will give us strength and help us overcome fatigue. We reach to beverages and supplements containing synthetic vitamins and energizing substances, often chaotically composed, unable to be absorbed by the human body, and completely unsuitable to our needs. For the short-lasting effect, we pay a high price: we burden the body, increase the risk of disease and accelerate the aging process. YOKO is a healthy drink based solely on natural ingredients that not only help to improve your mood, but above all, are beneficial to the body with cleansing and rejuvenating effects. 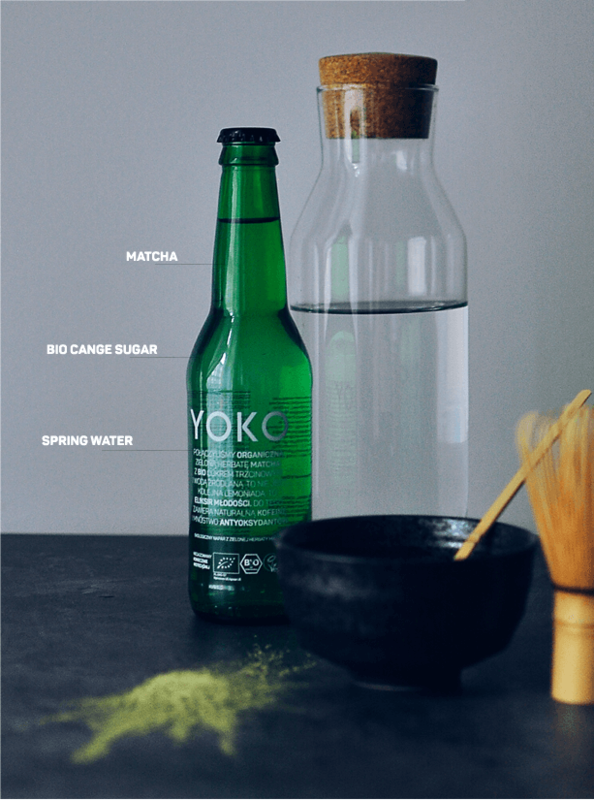 YOKO is three elements: spring water, matcha and unrefined cane sugar. Nothing more, nothing less. Based on a traditional recipe, which does not need improvement. It is perfect in its simplicity. YOKO is the essence of matcha's health properties – it has everything you need. Flavonoids (EGCG) – protect against harmful radiation, are anti-inflammatory, and above all, help to preserve and maintain youthful skin appearance. Flavonoids have antioxidant and anti-inflammatory effects. They act positively on the whole body (both physical and mental) but their main biological effect is mostly related to blood vessels and the circulatory system. Other polyphenols – a source of youth, inhibits the formation of free radicals, which adversely oxidize many compounds in the body. Polyphenols act prophylactically and therapeutically because they themselves oxidize, preventing oxidation of other important compounds in our body that may lead to disease. Vitamin A – affects the structure of strong bones and healthy teeth, protects skin from the harmful effects of UV rays. It contributes to the growth of new tissues and accelerates regeneration of the epidermis. Makes the skin look smooth and elastic. Vitamin C – promotes immunity. An effective antioxidant that prevents the aging process (also of the skin), improves the blood circulation. Vitamin E – a powerful antioxidant. It affects proper muscle capacity, and helps improve vision. Vitamin K – is responsible for proper blood coagulation. Vitamin B2 – plays an important role in the functioning of the visual system. Folic acid – determines mental wellbeing. Ensures smooth functioning of the liver, stomach and intestines. Pantothenic acid – determines the correct course of the energy release process, preventing fatigue. Iron – plays an important role in the fight against bacteria and viruses by the immune system. Potassium – improves brain oxygenation helping with concentration and mental processes. Zinc – is responsible for the condition of skin, hair and nails. Regulates the body's defense. It is an antioxidant. Magnesium – regulates stress hormones, prevents blood vessel spasms. Calcium – regulates the pH of blood, which has a decisive effect on human health. Reduces allergic reactions, is a strong antioxidant and has anti-stress properties.